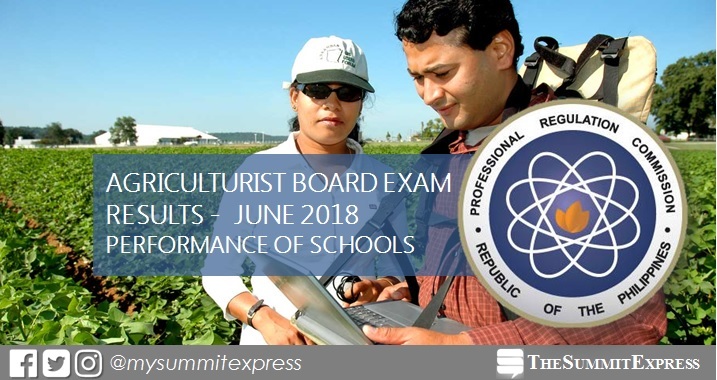 MANILA, Philippines – The June 2018 Agriculture board exam results, which includes the the top performing school and performance of schools are available on this page as released by Professional Regulation Commission (PRC) on Tuesday, July 3, 2018 or in five (5) working days after the last day of examinations. PRC conducted the Agriculturist licensure exam on Sunday to Tuesday, June 24, 25 and 26, in the cities of Manila, All Regional Offices and Zamboanga. In the April 2017 Agriculturist licensure exam, none of the schools qualified for the top performing list by PRC. In the November 2017 exam, University of the Philippines (UP) - Los Baños was the only top performing school with 99.22% or 128 out of 129 passed the exams.